The member companies of the Gypsum Association foster an accountable and environmentally responsible attitude. A commitment to preservation of natural resources, establishment of recycling and waste management programs, and dedication to land reclamation inform the actions of today’s gypsum panel producers. Product transparency is a high priority. Learn about the environmental performance of gypsum products. Contact us for more information. 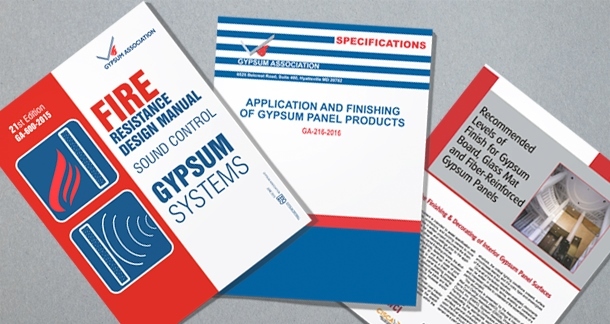 All Gypsum Association member companies participated in these industry EPDs. We invite you learn about our members and specify their products with EPDs. • CertainTeed Gypsum Canada, Inc. The creation of PCRs for North American Gypsum Boards and North American Glass Mat Gypsum Panels and corresponding industry average EPDs. For more than 50 years, manufacturers have been using recycled paper for board face and back. On an annual basis, the gypsum industry uses more than 40 million cubic yards of paper material destined for landfills—enough trash to fill more than 10,000 standard railroad cars. Gypsum can be recycled in many ways. It can be used as a soil conditioner and additive to concrete mixes. Clean scrap can be collect as part of a waste management plan and introduced back into the gypsum production stream.